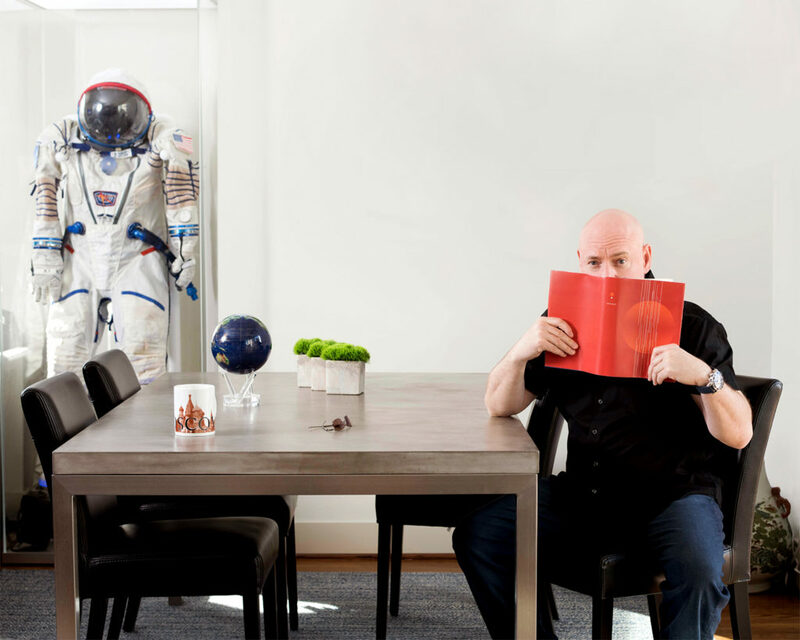 We got to work with Astronaut Scott Kelly! 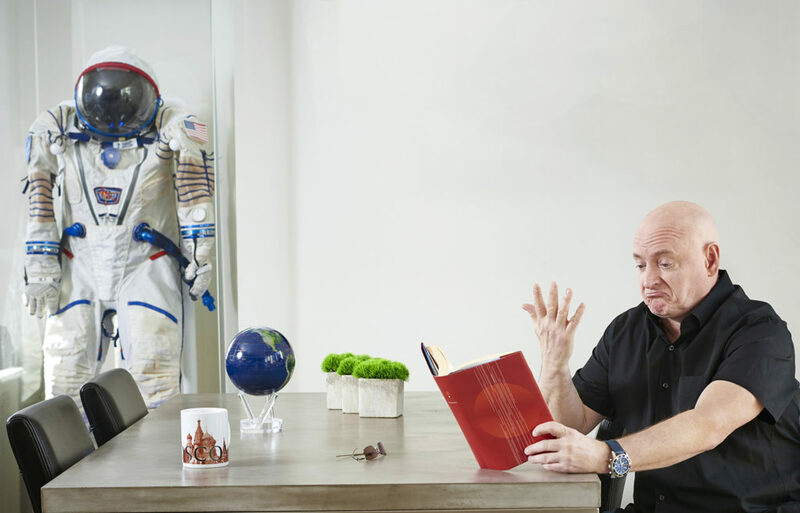 We were absolutely thrilled here at 2046 Design when we were asked by Southwest Magazine to create a book cover design for a photo shoot with astronaut Scott Kelly. 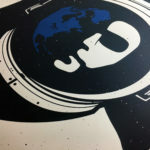 Finding the right balance of design, spacey-ness and simplicity was key for the client. 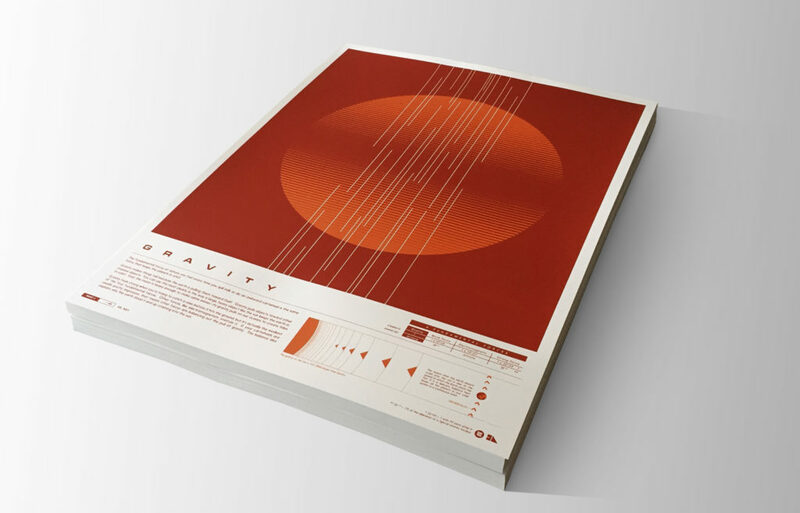 After sorting through a bunch of options we settled on a redesign of our Gravity poster for the book cover. 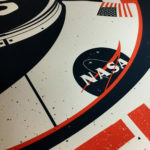 Just seeing a real live astronaut next to our design is beyond words. 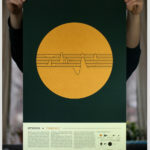 To check out the entire set of Fundamental Forces poster designs go here. It’s more of a feeling than a location. Aside from locations literally setting the stage in a story, buildings, monuments, and scenery can enhance and develop moments sometimes beyond words themselves. Architecture specifically has the power to mimic landscapes, rebuild the human form and translate time into a lasting monument. Be it in film or on paper, moments and experiences can transcend dialogue when paired with an unforgettable, symbolic location. Whether it’s the overwhelming feeling of vertigo, the unbearable weight of grave conclusions, or the glittering burst of joy, these experiences are made deeper and richer with the power of stunning visuals and meaningful settings. 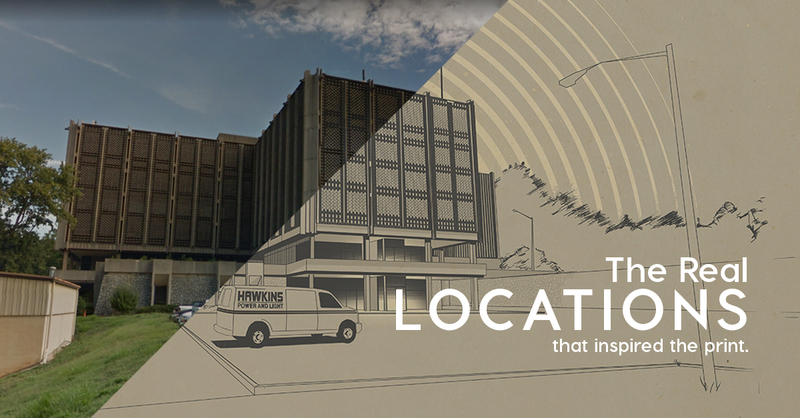 Hawkins Laboratory – This spooky show is made only spookier with the knowledge that the building that plays home to the Hawkins National Laboratory was once a mental illness hospital. Today it is part of Emory University in Atlanta Georgia. 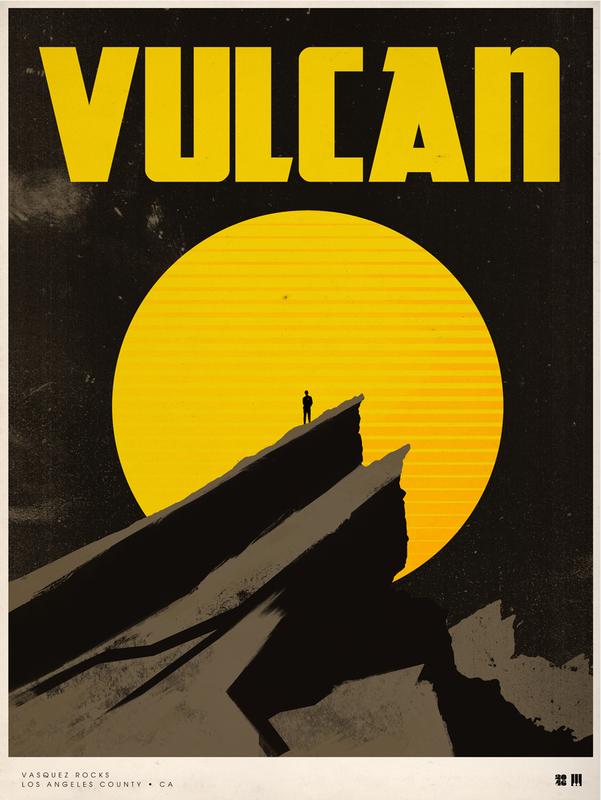 Vulcan – The planet Vulcan has been a location for the Star Trek series dating all the way back to the original TV show. Originally it was filmed in the outskirts of LA at the Vasquez Rocks Natural Area Park. Since then the landscape of the park has been recreated and digitzed to create the landscape of the whole planet. 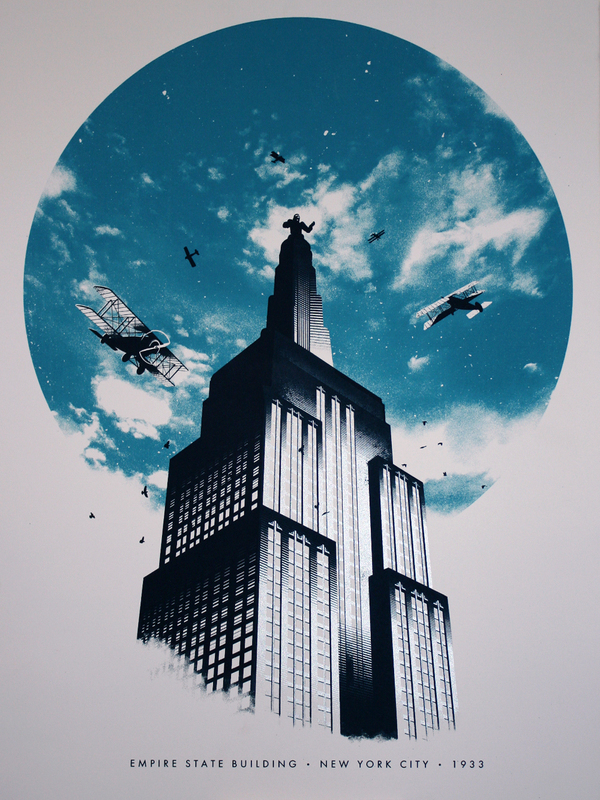 New York: 1933 – Originally this print was created for the 75 year anniversary of the original King Kong movie. 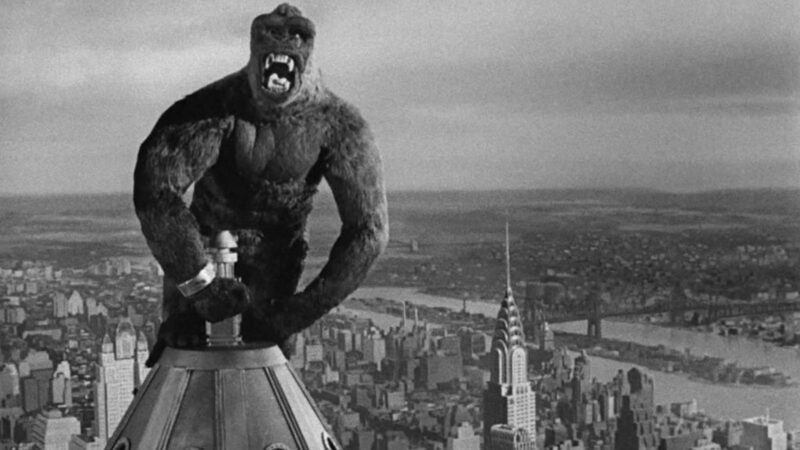 Since then we have seen just a few more King Kong flicks come out. 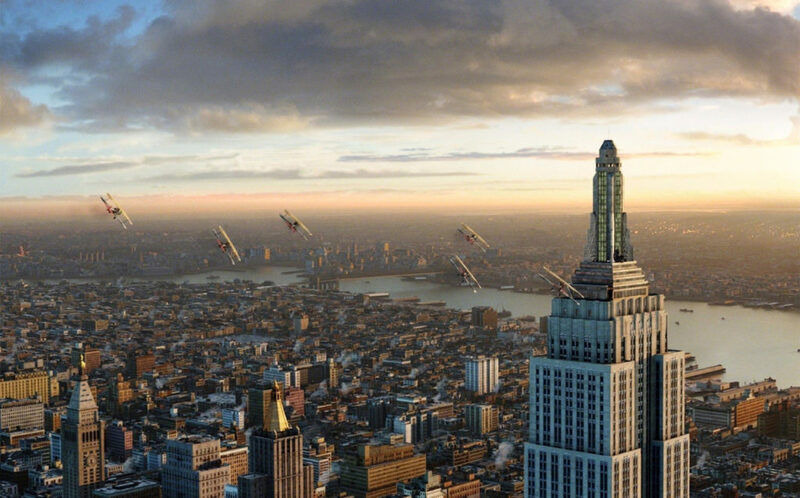 The Empire State Building is probably one of the most filmed and iconic buildings in the world and matches the themes and grandeur of King Kong perfectly. 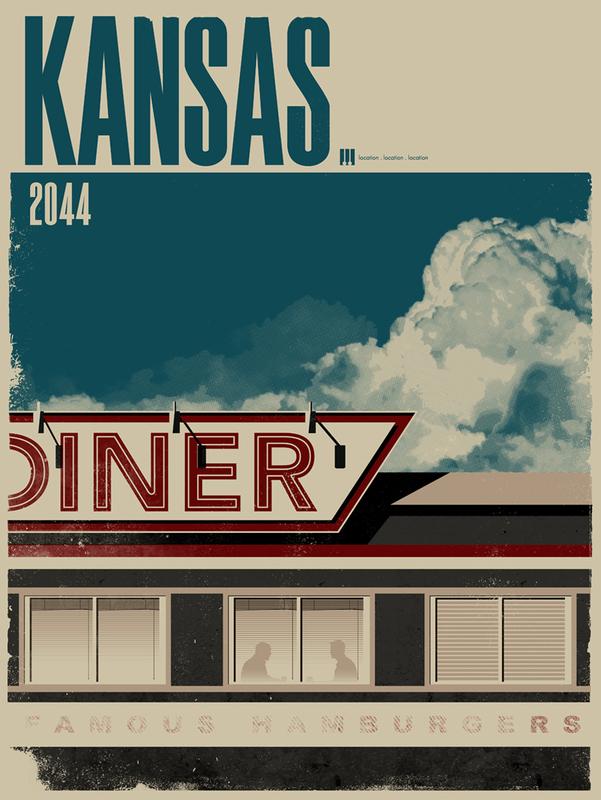 Kansas 2044 – While the location is partially fictional because it takes place in the future, I think the feeling and location of Kansas is still an interesting choice for this film. In the third act of this action sci-fi you would expect a big climax, but this film does not go down that path. Instead the film slows down to a country lifestyle. We find ourselves in a farm in the middle of nowhere instead of some futuristic sci-fi locale. The scene where the protagonist talks with his older self takes place in a diner, a diner! As with all good movies the science fiction concepts are just a tool to create great characters going through extra ordinary circumstances. 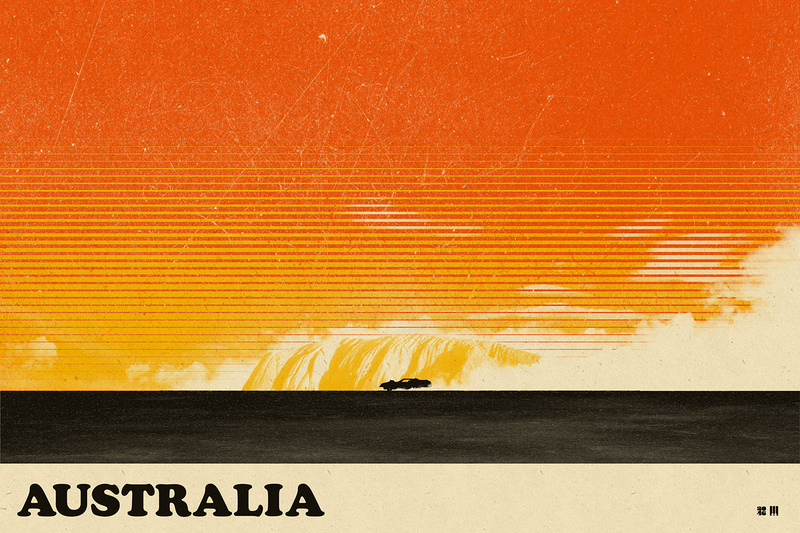 Australia – Not only is the Mad Max series of films some of the best to come out of Australia, the setting and story is so tied to the landscape of the country. Dry arid land sets the tone for the story, isolation and dystopic themes of the movie franchise. It simply would not feel the same if it took place anywhere else. Initech offices – The movie Office Space is filled with feelings of a stale, soul-less, office environment. The building used to film this movie is a perfect compliment to these themes. An nondescript strip mall in Austin taxes was the place where Mike Judge decided to film this movie. 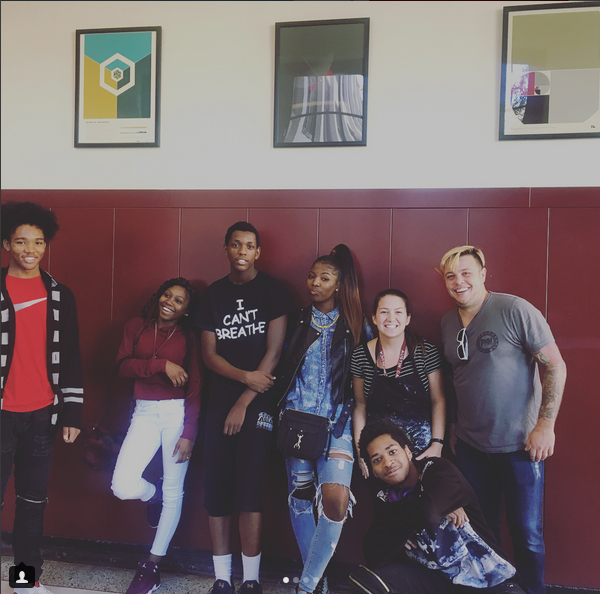 We are super excited to be sharing the news of a collaboration between 2046 Design and I Paint My Mind, a non-profit that works with public schools in Chicago to fill hallways with art. 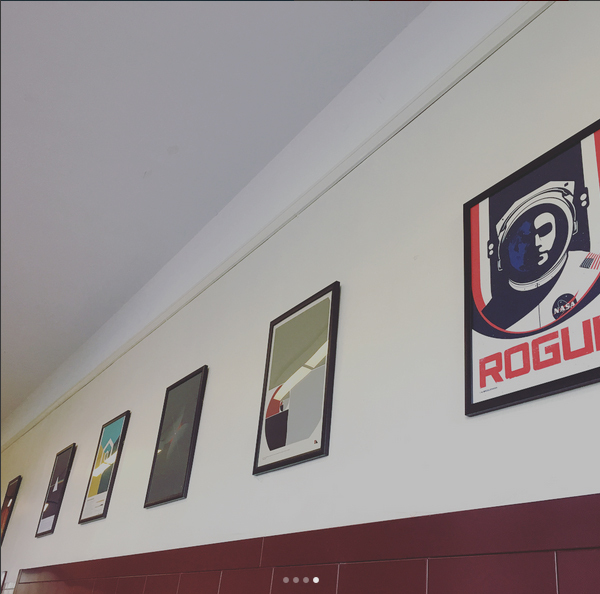 There are now 30+ posters from 2046 Design lining the hallways of Austin College & Career Academy on Chicago’s south side. We couldn’t be more happy with the results and are thankful for the hard work put in by the students at Austin College & Career and I Paint My Mind. Aside from locations literally setting the stage in a story, buildings, monuments, and scenery can enhance and develop moments sometimes beyond words themselves. Architecture specifically has the power to mimic landscapes, rebuild the human form and translate time into a lasting monument. 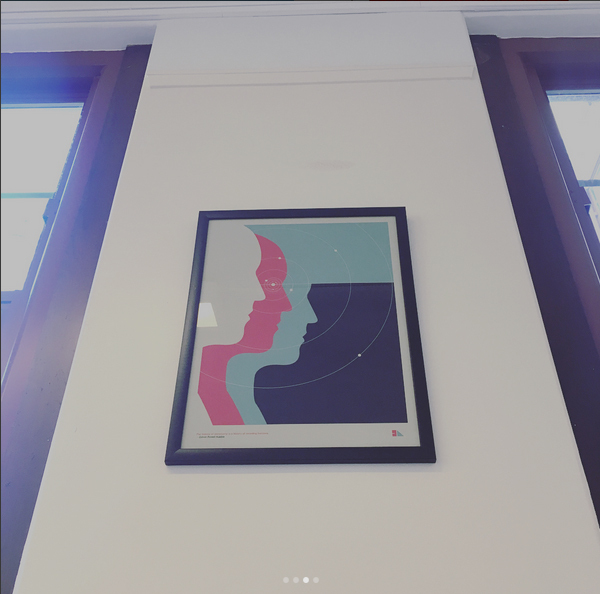 Be it in film or on paper, moments and experiences can transcend dialogue when paired with an unforgettable, symbolic location.Whether it’s the overwhelming feeling of vertigo, the unbearable weight of grave conclusions, or the glittering burst of joy, these experiences are made deeper and richer with the power of stunning visuals and meaningful settings. Inferences made on the human experience through an architectural landscape, setting, or location are beyond compare and continuously perfected in film, video games, comics, and even books. 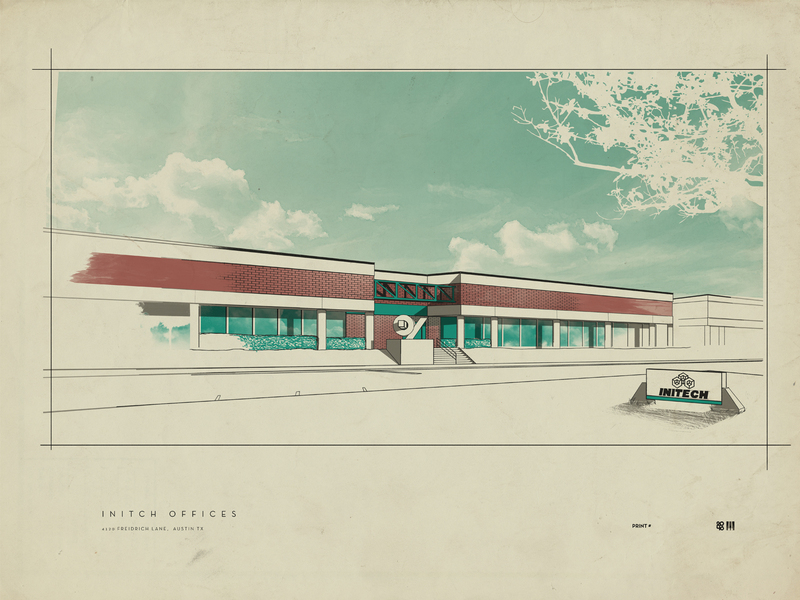 Galerie F is proud to present Justin Van Genderen’s “Location Location Location: Architecture” which features art prints of specific architecture and broader looks at locations in pop culture from books to cinema. Justin Van Genderen spends most of his time sticking to the ideas. The science. The truth of the matter. 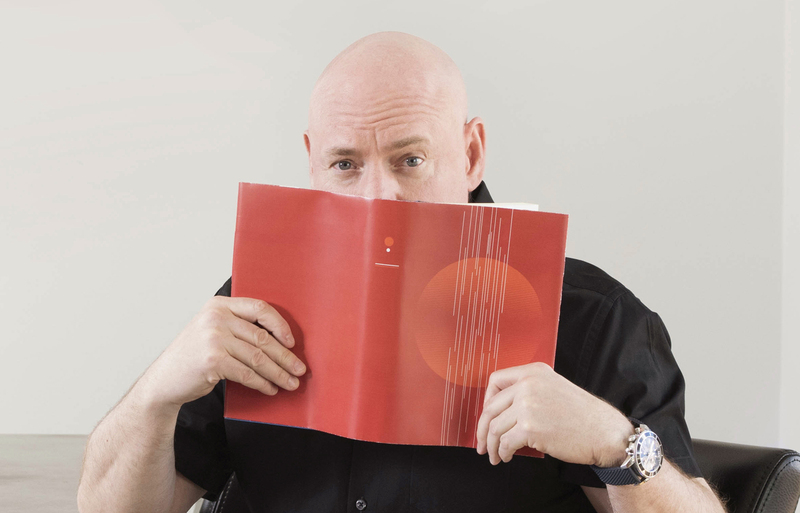 The intersection of Science, Art and Design is what occupies his brain most. His artwork in both the architectural and scientific realm seem to answer why we seek order in a universe that moves towards chaos, where our spirituality comes from and what human progress has to say about it all. He does all this while maintaining familiarity in these subjects through pop-culture, notable figures and scientific theories. 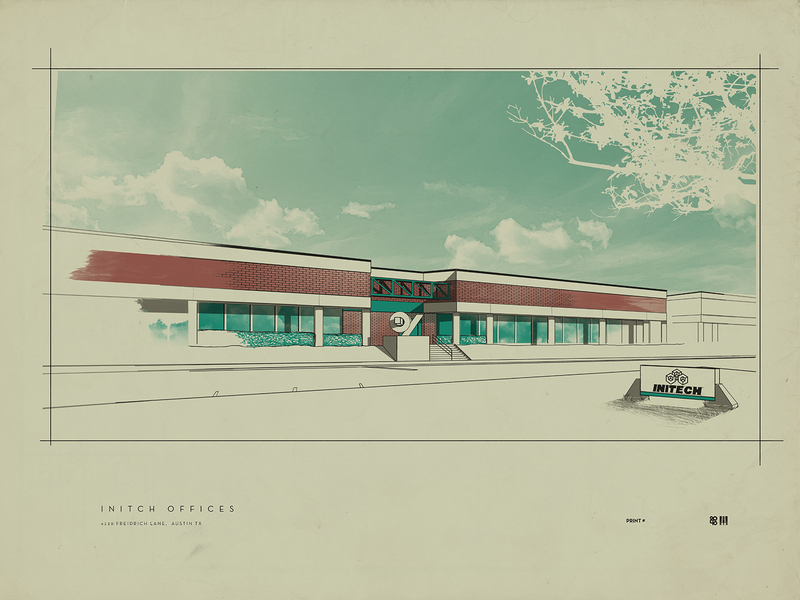 Prints on sale through Galerie F.
Initech Offices from the film: Office Space. Filmed at a strip of buildings in Austin, Texas. 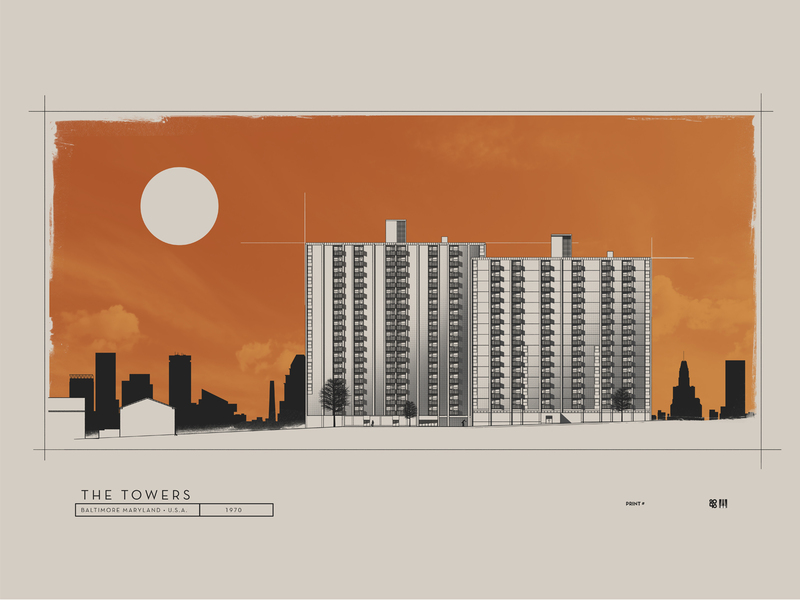 The towers from the TV series: The Wire. Filmed at the McCulloh homes in Baltimore, Maryland. Two Pines Chapel from the film: Kill Bill. Filmed at the Calvary Baptist Church in Lancaster California. 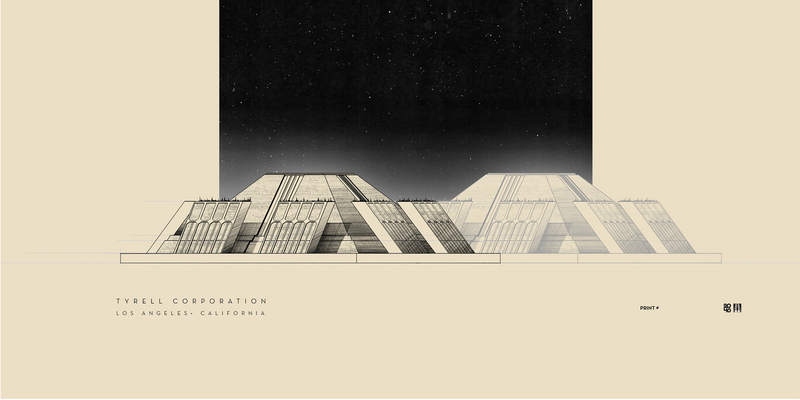 The Massive Tyrell Corporation headquarters from the film: Blade Runner. Based on the scale models built for the film. 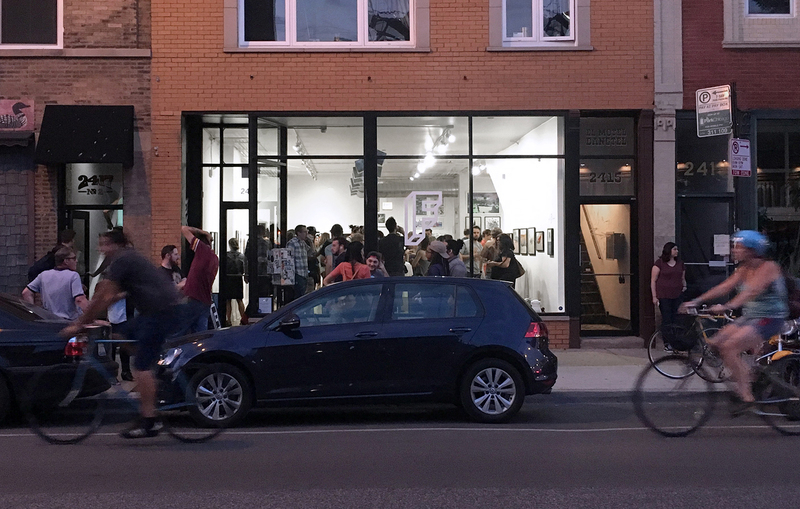 A shot from outside the gallery on opening night, thanks to everyone who showed up! 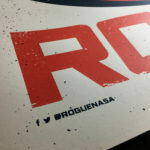 We’re really excited to share with you our new Rogue NASA poster. It’s been officially endorsed as the new logo of the resistance at NASA. When we saw it on their Facebook page, we were over the moon we were so happy. It can sometimes seem more like science fiction than science fact; multiple dimensions, sub-atomic particles, but I’ve been told by multiple sources that these theories are based on real evidence! 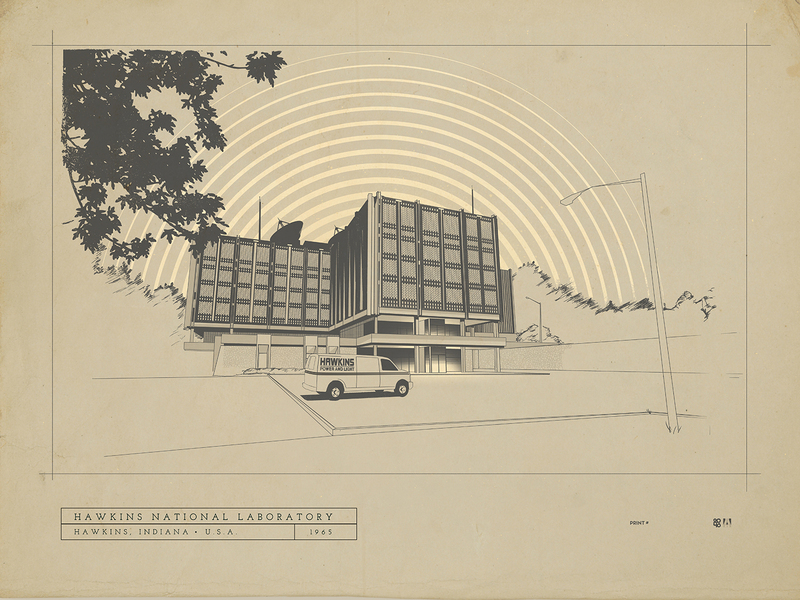 Here are 3 new prints that celebrate the scientific method and where it has led some of the smartest people on the planet. 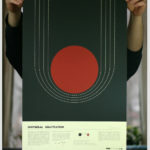 String Theory, Universal Gravitation & Quantum mechanics screen prints are now available for purchase. So this may not seem too profound to a lot of people, but for me it is one of the most significant facts I have come across in a long while. It’s no secret that I am a fan of objective truth and the scientific method. This belief stems from a disbelief in how my brain interprets information. While I know the human brain is a pretty powerful organ you don’t have to look far to see how it is failing us. I’ll avoid entering a diatribe of reasons why I think this world of ours is going to hell, but I will say that Donald Trump is currently leading the polls in the republican primary. 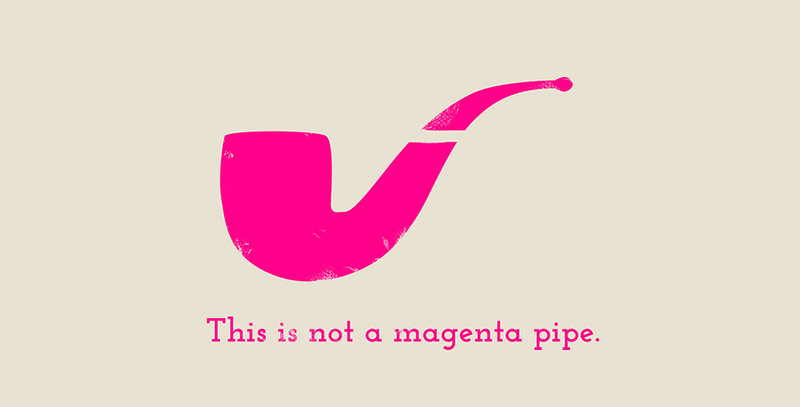 Continue reading Magenta isn’t real!?!? 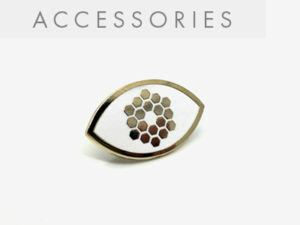 They are finally here! THE LAWS OF MOTION as put together by the great Sir Isaac Newton. I’ve been wanting to get these prints made for a long while now, and the folks over at Vahalla Studios did not disappoint. Three 18×24 prints laid out with precision on 100 lb French Paper. Newton’s laws of motion are three physical laws that, together, laid the foundation for classical mechanics. They describe the relationship between a body and the forces acting upon it, and its motion in response to those forces. They have been expressed in several different ways, over nearly three centuries, and can be summarized as follows. 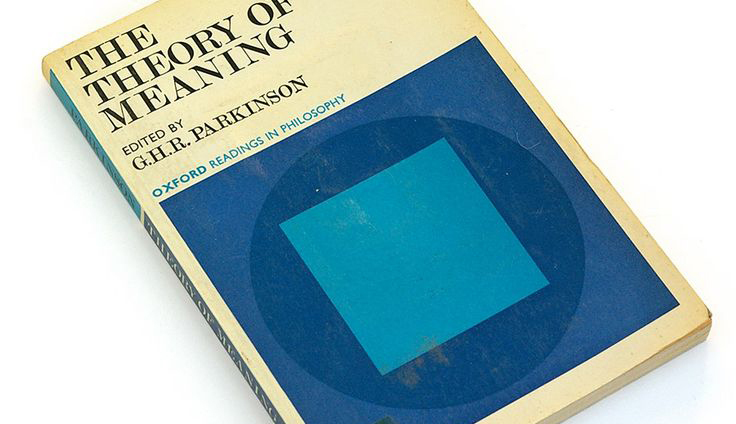 A lot of my work is inspired by old educational and informative book covers. Here is a small collection of some of my favorites. Welcome to 2046 Print Shop!!! 2046 Print Shop is excited to be joining together with all the other Internet pages to bring you stuff to think about and look at. 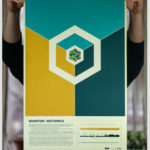 At our Print Shop you will find a lot of new design work, including my science posters. 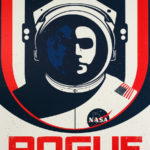 My interest in science posters was first sparked by my mild obsession with the Space Race. But then, whenever I found a new documentary about space or this planet of ours, I was drawn in–something as basic as gravity or as sublime as geological formations, it all made me marvel. The designs they inspired became more than just something I wanted to put on my wall, they started to help me see and understand the world. Continue reading Welcome to 2046 Print Shop!!! 2779 N. Milwaukee Ave #8 Chicago, IL 60647. Email Us.